Bizarrely recorded in mono and electronically processed for stereo sound, the trio of Tim Gane, Holger Zapf and Joe Dilworth have come together to record an album of dystopian sounds with a variety of heavy electronically treated influences. Upbeat electronic Jazz influences warp through the speakers the moment you hit play. Things are going well with the playfully simplistic, yet pleasing sounds when lunacy rears its ugly head from out of nowhere with the volume panning in and out at speed, only to be repeated throughout the track. 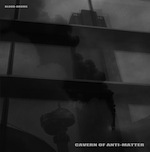 It’s clear that Cavern of Anti-Matter have their head stuck in the past; there is more than a nod to David Bowie along the way. The fundamental difference between their hero and themselves is that whilst he created music that captured a generation, ‘Blood Drums’ comes across as a trippy mess of badly executed electronics, that are as misshapen and badly conceived as you could wish for. Concept wise, this latest release portrays itself as a Z-list Tangerine Dream in some respects and considering I have no time for them either, some of the talent hidden on this album merely comes across like nonsensical dribble; which is a shame, as clearly these guys do have some musical capability.